ZAPTEST - QA Team Formation Wins The Game! Organization of the software testing process is the key to productivity of any QA practice in today’s Enterprise. Many organizations are lacking productivity due to the poor organization during consideration of their application development structure, change management and skills of their personnel. Lack of productivity in testing departments leads to the poor quality of software that result in the loss of company revenues. This leads to companies downsizing and playing it safe by outsourcing their testing to dev teams that are not quality assurance oriented. As a result, enterprises are still NOT achieving desired results in the quality of their software. One of the keys to successful QA practice is the right organization of testing processes. Like in Football, the right team formations lead to winning the game, QA leaders have to understand what formation of their teams will suit their play the best. There are many different combinations of the team formation, but I’d like to talk about the 2 most fundamental ones. Center of Excellence (COE) is the centralized organization of test automation practices and acts on behalf of the entire enterprise as a service organization. In COE it is efficient to define two roles of engineers: Subject Matter Experts (Experts) or QA Analysts who are focusing on the testing goals and test execution; and Test Automation Specialists (Specialists) who are focusing on development and maintenance of test automation based on Expert requirements. One of the efficient ways to organize COE is to orient Experts on a particular Application Under Test (AUT) while Specialists are developing test automation cross AUT. This way, the organization increases productivity of test automation by allowing shared test automation infrastructure (functions, objects repositories, test data, reusable modules) across all AUTs. ZAPTEST at the COE is used by the Experts and the Specialists. Experts are using ZAPTEST Step View to record testing flow and ZAPDOC to create test documentation (manual test cases), they are handing these base-line scripts over to Specialists to complete them with more sophisticated business logic and programming routine using ZAPTEST full scripting functionalities. 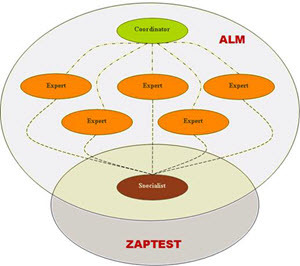 ZAPTEST at COE allows enterprises to expedite manual and automated testing. While Specialists are completing automation, Experts are using auto-generated test cases for manual testing. Once test automation is ready, Experts execute scripts with ZAP MULTIRUN and coordinate results with the application dev teams. Many enterprises are using Agile/DevOps application development. Unlike COE in the DevOps, QA Engineers are acting as single QA source per dev team; usually one person per team. However, in order to keep Quality Assurance integrity they are reporting to a centralized QA leader in the organization and follow seamless standards and processes. Considering short application development cycle iterations, DevOps QAs start test case development at the application design phase using GUI Mockups (either handed to them or creating mockups themselves) based on the AUT requirements. Their test automation architecture is usually light weight and flexible to rapid changes. ZAPTEST helps enterprises to achieve testing goals either for testing formal way (Waterfall) in COE or Agile in DevOps, and it can be used by test automation engineers for scripting or by QA Analysts for base-line testing and test documentation development. Thank you for your time reading this article! Please download ZAPTEST and get started today!